Leave M6 at Jnc. 10. 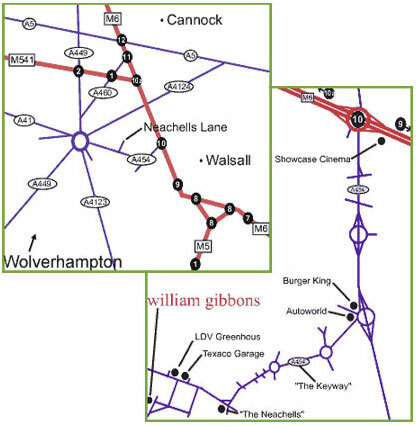 Take A454 Black Country Route towards Wolverhampton. Leave this road at the 3rd exit. Take 2nd exit off the island onto "The Keyway". At 2nd Junction, continue straight across (2nd exit) towards Wolverhampton. Move into right-hand lane and you will pass a set of pedestrian lights. turn right into Neachells Lane. Continue along here, over railway bridge, past Mercedes garage and on to the Texaco Petrol Station on the right. There is also an LDV garage on the left called "LDV Greenhous", turn left here into Planetary Road. Turn right and continue down the road. William Gibbons & Sons Ltd.